Illuminated Gospel Texts, Sculpture & Metalwork Produced in Monasteries of Ireland. After the collapse of the Rome Empire during the fifth century CE, barbarian tribes established pagan kingdoms among its ruins, leaving Christianity confined to a number of old Roman cities. However, in Ireland, sheltered by its geographical remoteness from Continental trade routes and former Roman cultural centres - which bore the brunt of the Dark Ages - the sixth century witnessed an upsurge in early Christian art embracing illuminated manuscripts (eg. 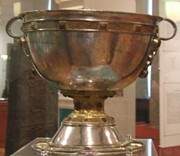 Book of Durrow c.650, and later the Book of Kells c.800); Irish sculpture such as the High Crosses; and outstanding Irish metalwork art, such as the Tara Brooch, the Ardagh Chalice , the Moylough Belt Shrine, the Derrynaflan Chalice and Paten, and the renowned processional crosses like the Tully Lough Cross and the wonderful Cross of Cong. The creative force behind this cultural upsurge of religious Celtic art was the founding of the Irish monasteries by missionaries like St Patrick, St. Brigid, St Enda, St Ciariana, St Columcille, and the growth thereafter of the Irish monastic tradition. In effect, this made Ireland the bastion of religious (and secular) scholarship during these centuries of barbarian power. Furthermore, not content to develop its own Christianity and culture, the Irish Church (from 563 onwards) sent almost one thousand missionaries to its largely illiterate neighbours in order to spread Christianity and to expand its network of monasteries. These medieval monastic centres of learning extended Irish influence across the continent of Europe in areas of theology, literature, architecture and the arts. Indeed, by the eighth century, almost every European kingdom employed Irish scholars to advise the royal court. In short, the maintenance of European civilization and the preservation of western classical learning during the Medieval period - and ultimately the Renaissance - was founded on Irish monastic culture, making it one of the most important eras in the history of Irish art. But Irish Christian culture didn't have things all its own way. From about the seventh century onwards, there were actually two competing forms of Christianity in Europe: the Irish form (heavily influenced by Ireland's Celtic traditions) - based on semi-independent monasteries, relatively secular in its acceptance of divorce accepted and married priests - and the centralized Latin or Roman form of Christianity - based on the supremacy of the Pope in Rome and stricter in outlook, as evidenced by its demand for priestly celibacy. Paradoxically, the more reformist Irish monastic approach was stricter in its demands for hard work from its monks. The architecture and locations of the Irish monasteries were more hermetic than those of its Roman counterparts, which led to higher standards of education and scholarship. Students enrolled in Irish-run abbeys from all over Europe to study not only scriptural topics, but also classical Greek and Roman art as well. In this way, the Celtic expertise in visual arts spread to all corners of medieval Christendom. Irish monasteries contributed to the visual arts in several specific ways. First, they taught illustration, illumination and calligraphy. For a wonderful example, see Christ's Chi Rho Monogram Page in the Book of Kells (c.800). Second, they commissioned a wide range of ecclesiastical metalwork, ranging from adornments for biblical manuscripts to liturgical artifacts as well as many everyday items. The metalwork techniques of lost-wax casting, riveting, soldering, filigree gold-work, enamelling - notably cloisonné enamelling - and others, were therefore developed and strengthened. Thirdly, monastic culture encouraged sculptors by its commissioning of Celtic High Cross sculptures on monastic sites across Ireland. These biblical sculptures - constructed during the period (c.750-1150) represent the largest body of free-standing sculpture created between the collapse of Rome and the Early Renaissance era. Lastly, by keeping alive the study of classical European culture, from Greek and Roman times, Irish monasticism paved the way for the exquisite Biblical art of the Sistine Chapel and succeeding art forms throughout Europe. In the end, however, for various reasons, the Roman model of Christianity triumphed. In the twelfth century, Ireland was invaded by Norman Kings of England and and ultimately colonized. Celtic culture declined, and later, even Irish monasticism collapsed, following the Dissolution of the Monasteries in the sixteenth century. Due to the survival of the Byzantine Christian tradition as well as the cultural splendours of the High Renaissance and the efforts of painters like Michelangelo and Leonardo Da Vinci, the Latin Church outlived centuries of corruption, the Reformation and a series of ugly wars to maintain its dominance into the present day. Ironically, the Italian Renaissance, at least, owes its occurrence to the cultural efforts of Ireland's medieval monasteries.  For information about Monastic arts in Ireland, see: Irish Art Guide.  For more on the history of illuminated manuscripts & ecclesiastical metalwork, see: Homepage.